Those green shutters belong to our room! Venice on a winter's night is a misty moonlit maze. Thanks to James and his map skills, we negotiated our way to Rialto Bridge and the warm room that was waiting for us, with a canal view to boot. We continued the walking theme of our trip, and took in the sights of St Mark's Cathedral(very big, very gold), St Mark's Square (which boasts the most expensive coffee in Europe - NZ$14 per cup!! ), the masses of city pigeons which you can feed (if you're mad and enjoy pigeons attacking you), the Bridge of Sighs, the little wooden Pinocchios, Carnavale masks and the gondola cruising down the canals. And of course, the thousands of shops selling glass. 80% of which comes from China (fragile, cheap, nasty). But you can find the good shops that only sell the real deal - hand blown Murano glass as it has been made for hundreds of years. There was an enormous range - from browns, oranges and golds to bright jewel coloured pieces, fancy chandeliers, vases, jewellery, little ornaments (I saw a whole miniature orchestra and the harps even had tiny thin strings made of glass! ), spiders with spindly legs, chess sets and aquariums with glass fish and bubbles inside. The best piece we saw, we fell in love with. After 24 hours of agonising and a few delicious cappucinos, we bought it! It's an absolutely gorgeous piece of art, in our humble opinion, so you'll have to come and see it whenever it is that we have a place in NZ. Staying in Venice, which is all stone surrounded by water, really makes you appreciate grass, trees, flowers and wide open spaces. Even after a few days I was feeling a bit trapped. And I felt a bit sorry for the people and dogs who had to go for walks through the tiny city streets with all the tourists because there's hardly a park or a lawn in the whole city! 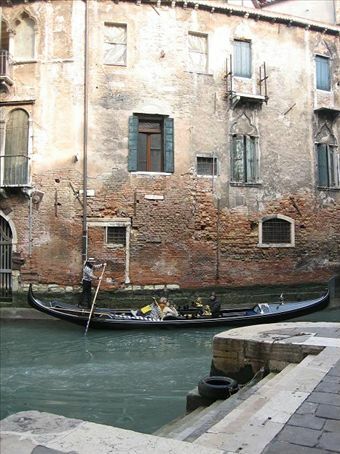 And since land is scarce, Venice makes Cannes prices look like a bargain! But it is a remarkable city - there's nothing else like it in the world.